These Vegan Brownie Bites are full of chocolaty flavor and are easily made in one bowl. Also known as “two-bite brownies,” these mini fudgy delights are gluten-free, refined sugar-free and nut-free too! Except now it goes like this: How many bites does it take to eat a mini brownie? A better question would be: How many mini brownies will I actually get to eat before my husband and kids devour them all? Zero. I will get to eat zero brownies. That is, not unless I stash them in a secret location in the cupboard where no one will find them (which is basically just toward the back of the shelf since they don’t look for anything past the front row anyway). What is needed to make vegan two-bite brownies? In order to make these brownie bites, you’ll need some aquafaba, which is the liquid found in a can of chickpeas. Not only is it an amazing vegan egg substitute, but it also gives you an excuse to make another dish with chickpeas (not that you need one because chickpeas are awesome). Just be sure you are using “no salt added” chickpeas to obtain your aquafaba. You’ll only need 6 tablespoons of aquafaba for this recipe, so you can store the rest in an airtight container (I use a mason jar) in the refrigerator for about a week. You’ll also need a 24-cup mini muffin tin and mini baking cups. I highly recommend using parchment baking cups to prevent sticking. Before you get started, you will need to preheat your oven to 350° F and line your mini muffin tin with mini baking cups. You’ll also need to melt the coconut oil and let it cool down to room temperature. Once the coconut oil has cooled, add it to a large mixing bowl along with coconut sugar, maple syrup, aquafaba and vanilla extract. Then, whisk to combine. Next, whisk in oat flour and kosher salt. Stir in the cocoa powder and then add mini chocolate chips. Fold in the chocolate chips. Then, scoop batter into baking cups. These Vegan Brownie Bites are full of chocolaty flavor and are easily made in one bowl. Also known as "two-bite brownies," these mini fudgy delights are gluten-free, refined sugar-free and nut-free too! 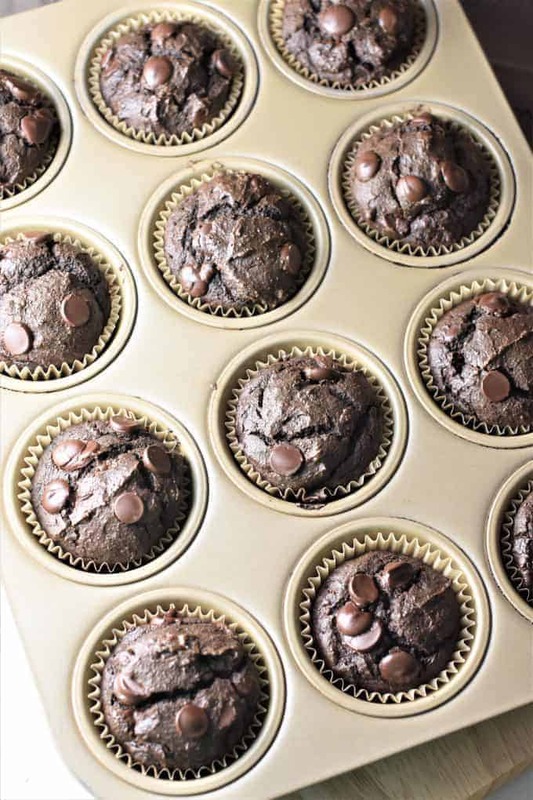 Line a 24-cup mini muffin tin with mini baking cups (I recommend using parchment baking cups to prevent sticking). Add coconut oil, coconut sugar, maple syrup, aquafaba and vanilla extract to a large mixing bowl. Whisk to combine. Whisk in oat flour and kosher salt. Use a small cookie scoop (I used a #60 disher) to scoop batter into baking cups. Bake on the center rack for 18-22 minutes until toothpick inserted in the center of one of the bites comes out clean with no streaks of batter (mine took 20 minutes). Allow to cool for at least 10 minutes. Brownie bites can be stored in an airtight container at room temperature for up to 2 days or in an airtight container in the refrigerator for up to 5 days. The nutrition information shown is an estimate provided by an online nutrition calculator. Accuracy is not guaranteed. Information shown should not be considered a substitute for a professional nutritionist’s advice. Please note the nutrition calculation for this recipe does not include the aquafaba since there is limited information regarding its nutritional composition. According to Aquafaba.com, aquafaba adds approximately 3-5 calories per tablespoon. Tried this recipe?Mention @watchlearneat or tag #watchlearneat! Never miss a recipe!Subscribe to our e-newsletter by clicking here. This post may contain affiliate links. We are a participant in the Amazon Services LLC Associates Program, an affiliate advertising program designed to provide a means for us to earn a small commission (at no extra cost to you) when you purchase from Amazon through our link. ©Watch Learn Eat. All content and images are copyright protected. Recipes and images are not to be used or republished without prior permission. If you adapt this recipe, please re-write the recipe in your own words, and link back to this post for the original recipe. Sherri Hall: Recipe creator. Writer. Chickpea fiend. Lover of 80s music & song parodies, especially with food puns. Greg Hall: Food Photographer. Recipe tester. Subjected to listening to ridiculous songs about food. Hi! We're Sherri & Greg of Watch Learn Eat! We create (mostly) gluten-free, vegetarian and vegan recipes.